Basildon sport has received a shot in the arm following the opening of a near £1m scheme at Everyone Active’s Eversley Leisure Centre. Production & customer processes at a top steel fencing manufacturer have been heavily audited recently – by customers, the security ratings standards body and an international certification agency. Two new innovations have made the premier rapid-deploy perimeter protection system even quicker to install. The original anti-vehicle rapid-deploy temporary electric fence system – first used in tandem on the London 2012 Olympics – is now even quicker and easier to roll out. The rapid rollout, relocation and removal of holistic temporary high-security protection came together seamlessly and to customer acclaim at International Security Expo (ISEC) stand F41. ‘Fantastic synergies’ and a fresh driving influence mean that Fastline and Zaun are already experiencing benefits. The UK’s leading manufacturer and supplier of electronic and electrified perimeter security systems has added to its dealers with what it describes as ‘one of its most prestigious signings to date'. A 1,000-strong manufacturers’ organisation that promotes the value of British manufacturing as a differentiator is coming to Wolverhampton for its first sales and marketing workshop of autumn. The redevelopment of tennis courts in a London borough park are the first priority in a 15-year masterplan. This photo shows the incredible raking ability of Zaun’s ArmaWeave fencing system. Two giants of the UK perimeter solutions market are joining forces. Zaun Limited has acquired all the intellectual property rights (IPR) and assets of EyeLynx Limited after the voluntary liquidation of its former subsidiary. Norwegian artificial turf experts have turned to a British steel fencing manufacturer to support their move into installing MUGAs (multi-use games areas). Zaun Limited of Wolverhampton is a fencing, railings and gates manufacturer, specialising in weld mesh. Our fencing systems are used across the country in both the private and public sectors, and we have a reputation for quality product, excellent service and punctual delivery. We supply all fencing and railing types, sports fencing, security fencing, perimeter fencing, play area fencing. We have a large range and we are constantly developing our products to suit both the customers demands and the recommendations made by various safety and regulatory bodies. We have our own weld mesh making machine that enables us to manufacture fencing from the raw wires. This way we can cut costs and these savings are passed on to our customers. The popular Gemini system is available in a number of attractive styles; Convex, Concave, Wave top, and a new development, the Surf style. Because of its strength and great looks, Gemini is ideal for housing projects, schools and prestige projects where the fence needs to be a feature as well as a secure boundary. Zariba, is designed specifically to offer a strong, safe, yet aesthetically pleasing fencing system. The smart ring top design comes with ball finials as standard, and provides an ideal alternative to bow-top railings. Zariba is specified in an extremely wide range of projects from schools to zoos, largely due to its striking good looks and ability to delicately segregate or act as a barrier in virtually any environment. Zaun's DUO Perimeter Fencing System has been developed to give the customer all the required features of a premium quality perimeter fence. In designing this panel, Zaun asked customers what they required of a perimeter fence, and in response were told that it was a long lasting, tough, vandal resistant fence that had a low visual impact and offered 'best value' to the customer. The DUO perimeter fence meets all these needs and more. The Optima panel uses 6mm horizontal wires and 4mm vertical wires, and v-pressings along the length of the panel result in a stronger fence and make it easier to install. Available in heights of 2m and 2.4m, the panel has 3m post centres meaning fewer posts than other systems, lower cost/meter and quicker install times. Axiom is a functional yet smart fence, making it a practical solution for general perimeters. It is a modern and visually appealing heavy welded mesh panel manufactured from 5mm wires, which are resistance welded at each intersection. Axioms strength and rigidity is derived from the three V-pressings, which run along the length of each panel. Based on Zaun's Duo8 twin wire panel, DualGuard is the ultimate heavy duty security panel. A tight 25x200mm mesh means that the fence is extremely difficult to climb as it offers no finger or toe holds. The tight mesh and the extremely tough wires also mean that the fence is also extremely difficult to cut through. For added site security, the system can be partially buried underground, to prevent intruders going under the fence, and it can also be cranked at the top so it is much more difficult for intruders to scale the fence. Despite the comparatively small mesh size, DualGuard will still blend in to its surroundings, effectively disappearing when viewed from even a small distance. Zaun HiSec provides a high level of security where it's most essential, around highly problematic or sensitive areas. As a result it is the first choice for those wishing to secure a wide variety of sites, including schools, commercial properties, prisons, airports and many more. The system has been recently developed to provide even better protection than ever. HiSec Super has been developed in consultation with the Home Office as our premier high security system, aimed at high profile and sensitive sites requiring the greatest perimeter protection. It is based on HiSec, but is even stronger, presenting a formidable barrier to anyone trying to gain unauthorised access. The 4mm horizontal wires remain the same however the vertical wires in HiSec Super come in 6, 8 or 10mm gauge with either a 76.2mm or 50mm spacing. The systems have achieved Secured By Design accreditation from the Association of Chief Police Officers and Security Rating certification to LPS1175 and entry into the Red Book from the Buildings Research Establishment – with Super 10 achieving SR2. This system is designed to secure sites of critical importance. Installed on multiple high profile locations, ArmaWeave has unique system properties, which give significant advantages over other perimeter fencing solutions. The woven mesh system offers a more substantial delay from attack, from hand and powered non-contact tools than would be offered from traditional welded mesh systems – thanks to its tighter mesh pattern and use of high tensile steel wires. ArmaWeave also offers seamless integration with detection systems including PIDs, CCTV and topping enhancements. 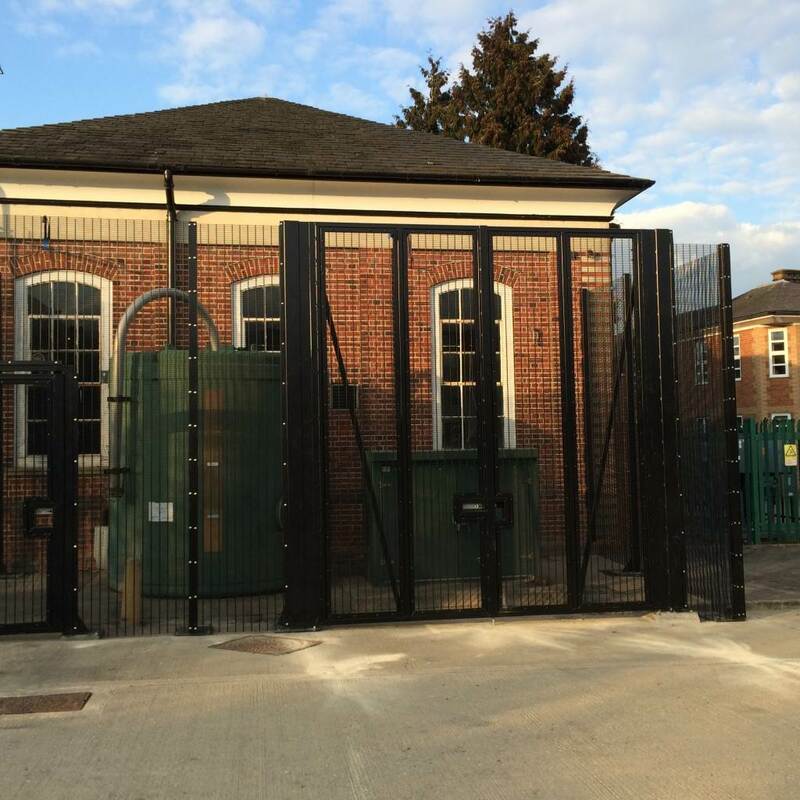 DBS is a truly innovative acoustic and anti-ballistic perimeter protection solution. Made from recycled mixed plastic bonded together using a laminate construction method, this unique system manages ambient noise attenuation whilst also giving protection to manual attack and mitigating the effects of fragmentation from explosive devices – this is due to the construction properties of this versatile laminate. DBS is suitable for various applications, providing a screen or barrier solution to your site to protect equipment or personnel defence measures. This system is incredibly versatile and can be used externally or internally. Requiring minimal maintenance as the system will not rust or rot, it is ideal for any environment. Duo Sports fencing has been proven to withstand the rigours of the most demanding applications such as five-a-side football. The twin wire panel consists of two 8mm horizontal wires welded either side of the vertical wires. Safe play is ensured as the panel ends are covered with a continuous clamp bars to eliminate the risk of catching on the wires. Duo sports fencing even includes special rubber inserts so that noise is reduced from ball impacts; a feature that is highly appreciated and essential in residential areas. Duo Sports Lite is the latest development from the Duo range. It offers the best economy by using fewer materials in the construction. Duo Sports Lite offers a lighter weight, lower cost alternative to Duo Sports. The Lite version does not use rubber inserts used in the standard Duo Sports system and the panels are fixed to the poses every 400mm as opposed to every 200mm. This is ideal for situations where the noise from ball impacts is not likely to cause a problem with local residents. The system further drives down costs by using only the Duo6 panel. This lightweight panel keeps costs to a minimum, but the dual horizontal wires welded either side of the verticals ensure that the system retains the high level of rigidity necessary for ball courts. The Twin horizontal 8mm wires ensure vital resistance to deformation from impacts and vandalism and it is suitable for a range of multi sports games areas. Most importantly, the high-density twin wire construction allows for rebound qualities similar to that of a solid surface, meaning that the angle at which a ball strikes the surface will be the same as the angle at which it leaves the surface. The panels' structural strength makes it ready for the pressure and abuse of many sports activities, giving the fence a degree of rigidity unparalleled by any other wire product commonly available. We developed our hockey system to overcome the problems with traditional wooden board fencing, which is expensive, needs replacing and creates a lot of noise during play. The Zaun system uses twin wire 8mm wires in a close 25 x 50mm mesh pattern to clad the lowest 210mm of the fence, or up to 400mm behind the goals, topped by Super Rebound. This results in an extremely robust section of fence that is able to withstand the cannonball-like impacts that occur during a game of hockey. However for pitches that endures heavy use, the body panel is available in a 100 x 50mm pattern to create a strong panel in which the vertical wires are extremely resistant to impacts. Measured under the same conditions the noise from ball impact on traditional hockey boards was 97dB, while Zaun Hockey fencing produced a noise of only 68dB. Zaun Spectator Railings improve safety for both players and spectators. The players feel that the game is played at a higher level and that there is less likely to be any incursion on the pitch by eager fans. The railings are manufactured to the highest quality from strong tubular section – and can be supplied with or without mesh infill – making them lightweight, robust and attractive. EPDM rubber inserts insulate the panels from the noise from impact during play, while stylish fixings hold the horizontal rails. Swimming pools can be extremely dangerous places and many children and adults are injured or worse each and every year. Children need to be constantly supervised around swimming pool areas and unlawful entry of swimming pool areas can have disastrous consequences. Ensuring that your area has the correct fences around it can help prevent these accidents. Zaun’s Colosseum sports system has been developed to ensure maximum playability, making it the ultimate MUGA (Multi Use Games Area) for all play environments from schools to urban settings that experience aggressive play and heavy use. Colosseum is constructed from a combination of hollow tube railing panels and twin wire mesh and combines football and basketball in an attractive design that encourages play. Its dynamic curved styling inspires young people to use the court as it looks purpose built rather than a simple fenced-in area, ensuring higher usage and a better return on investment. The system is available as a full court, or when budgets or space are restricted, the goal ends can be purchased separately. They offer the same flexibility as the full system, allowing you to specify any width and various heights dependent on your ball retention requirements. Ideal for any situation where bicycles are likely to be left, Zaun Bike Lockers are the best value available. We had to agree when a head teacher approached us saying bicycle lockers on the market were overpriced. So Zaun developed extremely robust locker units that can be manufactured, delivered and installed affordably. They use a simple yet strong locking system to ensure the security of the bike, and either 200 x 50mm or 200 x 25mm mesh can be specified as the locker body. Individual bike lockers mean that the bicycle cannot be tampered with and eliminate the need to remove the saddle or the rear wheel. In school environments individual lockers encourage pupils to be responsible for their own bicycles. The bike lockers use tamper resistant fixings to ensure individual bikes are kept safe. Derived from the vertical bar railing family, however using modern manufacturing techniques, Holloway Railings use traditional solid vertical bars and flat horizontal steels to create this attractive new railing system. The system can be supplied in either a galvanised or power coated finish to meet the specific requirements of the systems application. Bushberry is a stylish variant to Zaun’s vertical bar railing system. By adding a mid-rail, we are able to reduce the number of vertical bars to the upper section of the panel, creating a striking feature. To find out more about Bushberry Railings please visit our website. Zaun offers a range of modern railing systems that are either welded or weld-less in construction. Strong and durable, railings are able to withstand great impacts and are extremely resistant to vandalism. Zaun’s range, however, is also extremely attractive and as a result Zaun railings are often specified in public areas.